No matter if you are using storyboards, nib/xib files or setting up your UI via code, with or without auto-layout there tend to be modification, setup or manipulation of UI elements in the ViewController. I firstly recommend that you use auto-layout as this saves you lines of code trying to make the UI adjust in smart ways to have dynamic layouts. This can be difficult and come with trade-offs when developing with Xamarin/C#. But in reducing code complexity and having a dynamic UI, it’s hard to beat. By placing the managers as instances in the AppDelegate I have more control of their life cycle. May not differ that much from normal Singletons, but at least now I have central place where I manage and store my managers. I can also easily reach them via AppDelegate.sharedDelegate().dataManager. This will often greatly reduce the size of your ViewController class. I can also the move out helper methods that are only used by your extensions. This one of the primary ways to keep your UIViewController clean in my opinion. Unfortunately the extensions cannot hold any instance variables, so you still have to keep state variables for your UITableView in your base ViewController. You can if you have a lot of instance variables only related and used by your UITableView extension move this to a ViewModel inner class that you at least place in your MyTableViewDataSource class. This allows you to keep one viewModel class for your ViewController which does not contain any variables related to your tableView. You still however need to keep a reference in your MyViewController as extensions cannot have instance variables. The use of singletons in your ViewController will introduce more hard coupled links to other part of your application. Instead you want simple small loosely coupled parts that have as few and clear dependencies to other parts as possible. This is a wider discussion I will not fit in this blog post. The author also argues that the navigation logic should not be present in a ViewController. Moreover it shall not know what kind of context it is used in (which I agree to). It does not need to know where it was started from, or which view it is embedded in. However, I have not yet though on how or why to refactor out navigation logic. This is perhaps because I am so used to Storyboard where it is difficult to achieve good separation of View and Navigation Logic. I have to look into this more. 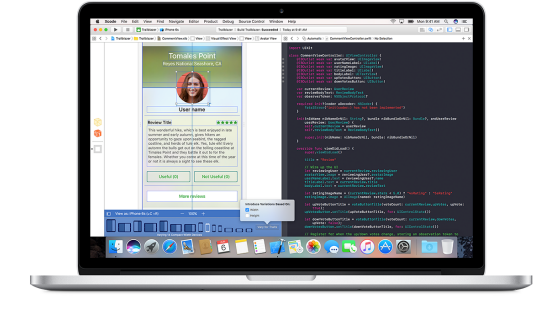 Swift Protocol Extensions have made it easy to separate delegates and parts of code related to UIViewController both into separate parts and files, which makes the code more easy to structure, maintain and read. Using Auto Layout decrease the need for UI logic in your view controllers. Also putting your custom UI setup code either in UIView subclasses and/or creating them in Storyboards or nib/xib files reduce the amount of code in your ViewController. Overall refactoring of duplicate and reusable code into subclasses or extensions can greatly reduce complexity as well. Also making sure that logic for handling Core Data, Networking and other separate task are placed in other locations than in UIViewController should always be the practice. This is my first blog post and there are more interesting topics related to UIViewController, Extensions, Delegates, separation of code that can be discussed. I am always open to discussions and improvement. If you have any comments, questions or even better suggestions on how to keep your UIViewController clean, please post below.